Make the first impression a lasting one by presenting client proposals or final projects in a professional looking folder. Make the first impression a lasting one by presenting client proposals or final projects in a professional looking folder. The Modern Metallic Executive Style Report Cover has an impactful appearance setting it apart from others available. 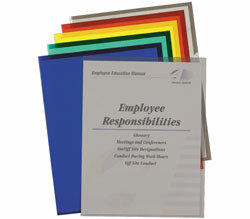 The report cover is made of extra durable, rigid polypropylene material and features a unique textured finish, instantly adding a touch of flair to the report. Store 8-1/2 x 11 size documents inside the cover by using the black swing clip to secure pages in place. To use, simply swing open clip, insert pages and close clip to secure contents. The swing clip is designed to make it easier to add and remove pages without taking the entire report out of the cover. The opaque cover keeps the contents of the report private until opened. Brilliant Black. 5/PK.